We have a special block on the homepage named "Fav Region Reports". 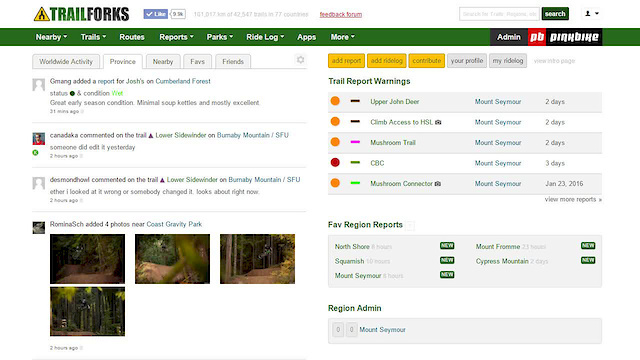 This feature makes it faster too view recent reports & monitor for updates for the regions you ride often. The feature lists the regions you've added to your favorites list. It then tracks the last time you viewed the reports page for each of these regions and informs you if any new reports have been added since that time. Like how most internet forums work. Viewing the reports page for a region will reset the "new" reports tag for that region. You can also clear the "new" flag by clicking it in the block, rather than visiting the reports page for that region. This feature only works if you are logged into Trailforks. The grey time beside each link is the time of the last trail report in that region. You can manage which regions are shown in this block by visiting your favs page on your profile. You can add & remove regions on your favs list and sort the order the regions are shown. This homepage block only shows the first 10 fav regions. You can also receive email notifications for new reports in a region, read here about how to setup subscribing.